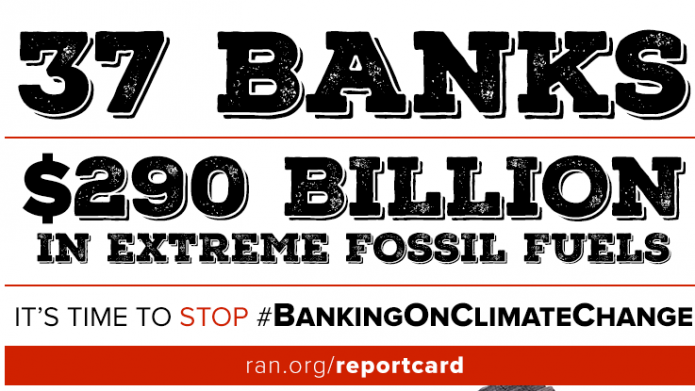 For ‘Banking on Climate Change’ – the eighth annual report card – BankTrack and their partners Rainforest Action Network (RAN), Oil Change International and Sierra Club have expanded the grading coverage of fossil fuel policies to 37 banks from across Europe, the United States, Canada, Japan, China and Australia. The publication is packed with new data, and RAN’s online presentation of some of the stand-out material is highly recommended for a quick, accessible browse. But one of the most telling aspects of the data crunching is this regional breakdown of average grades across sectors. What we’re seeing most starkly is the growing chasm between European and US banks on the one hand, and the rest of the world on the other, with tightening coal policies at the former institutions driving this phenomenon. Chinese banks continue to be unengaged, but the five ‘F’ ratings of the big three Japanese banks – Mitsubishi, Mizuho and Sumitomo Mitsui – is startling, and unfortunately in keeping with what we’re regularly seeing now at the coal project level in southeast Asia. As Greenpeace and Sierra Club have pointed out recently, with its plans to build 49 coal plants, “today, the biggest investor in coal is a country not many would expect – Japan”. And Japan’s banks are still intent on sowing climate chaos and public health problems across borders. More widely, with the report card’s breakdown of individual and total figures for extreme fossil fuel financing between 2014 and 2016, there is better news: the $87 billion total identified for 2016, the first full calendar year to be studied since the signing of the Paris Climate Agreement, represents a 22 percent drop from the previous year. But the bottom line remains that from all 37 banks, between 2014 and 2016, $290 billion of direct and indirect financing was doled out for extreme fossil fuels – that is, huge levels of new investment in the exact subsectors whose expansion is most at odds with reaching climate targets, respecting human rights and preserving ecosystems. This shocking finding is part explained by the scant policy coverage at the majority of banks where extreme oil and LNG export financing is concerned, as we’ve once again identified this year. In the context of the current pipeline boom captured in the report card’s case studies, and the growing risk that the Dakota Access debacle will be repeated, banks’ lack of a policy approach here is nothing short of alarming. Banktrack.org will be returning to some other facets of the report card on this blog in the coming weeks. It really is crammed with rich (albeit grim) data, analysis and collaborative testimony from civil society partners all over the world, which we’ll flesh out further in a series of upcoming posts. For a further quick flavour, though, do also check out the Guardian’s coverage of the Report Card launch. This article was originally posted at Banktrack.org. Yann Louvel is the climate and energy campaign coordinator for BankTrack since September 2010. Before that he worked as private finance campaigner for Friends of the Earth France for 3 years. Greig Aitken joined BankTrack in August 2014 to help strengthen our global coal campaign’s research and outreach impacts. Previously he was Media coordinator for CEE Bankwatch Network.